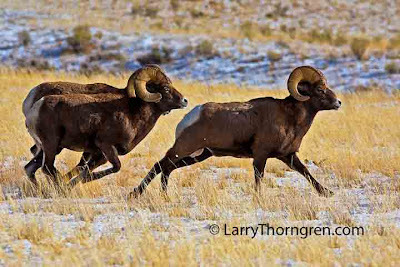 I was photographing these Bighorn Rams in Yellowstone this past November, when another bunch of rams came off of the mountain about 1/2 mile away. These rams proceded to run over to interact with the new rams and I took their photo as they ran by. Canon 5D, 300 mm lens. When I find photogenic animals, whether they are wolves or birds, I stay as long as there is a chance for something interesting to happen. 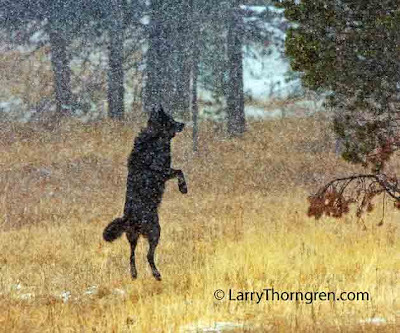 This black wolf was being annoyed by a couple of magpies in Yellowstone this past fall and jumped to chase them away. The magpies barely show up as some of the white spots where he is looking. It was snowing very hard, but I managed to catch him suspended over a foot off of the ground. Black Wolf, Canyon Pack, Yellowstone National Park. Canon 40d, 500 mm lens. A Great Egret just as it speared the goldfish it had in its' bill shown in an earlier post on this blog. Wetlands Park, Las Vegas, Nevada. Canon 5d, 500 mm Lens. 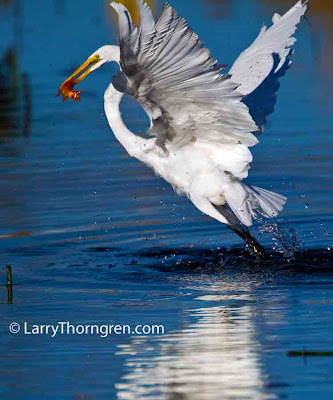 This Great Egret has just speared a fish and is leaving to avoid other Egrets and a nearby Great Blue Heron that might steal its' catch. I think it must be a goldfish that someone turned loose in the stream. It doesn't look like any native fish found in Nevada. Wetlands Park, Las Vegas, Nevada, Canon 5d. 500 mm lens. Labels: Great Egret, Las Vegas, Wetlands Park. 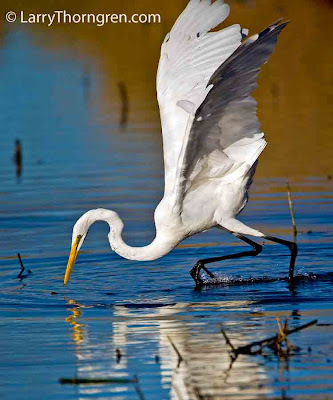 This Great Egret is just taking off to another fishing site. 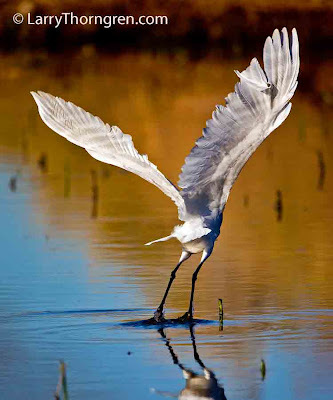 Egrets will hunt one area of a stream for some time and then move to another place to look for prey. 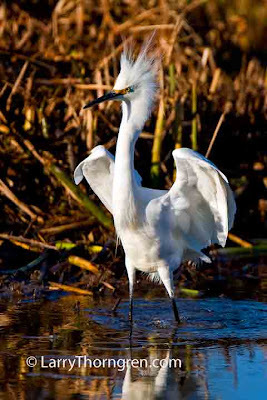 This Snowy Egret has just landed and is trying to intimidate an Ibis into giving up its' just-caught crayfish. The Ibis ignored the Egret and quickly swallowed its' catch. I watched this Egret try to steal crayfish from the 5 or 6 Ibises that were hunting in the little stream, but he was never successful. He did catch a crayfish that the Ibises flushed out from its' hiding place. 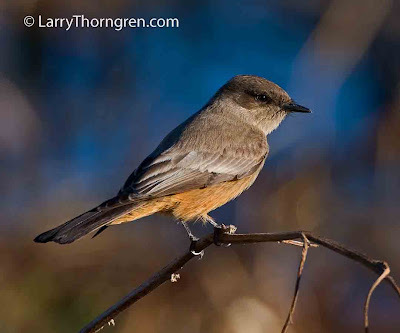 These flycatchers are common near water, in Southern Nevada this time of year. I see them almost daily when I am out looking for photo subjects. They get used to human activity and can be photographed with a little patience. .
Wetlands Project, Las Vegas, Nevada. Canon 40d, 500 mm lens. 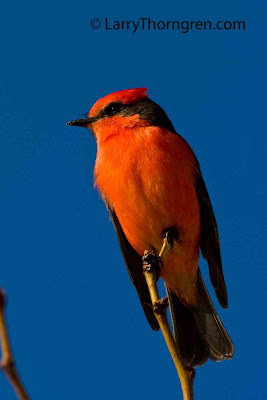 These little guys sit exposed on branches watching for flying insects to capture. They are very easy to see. Too easy. Hawks and falcons should have no trouble finding and catching all of these vermilion colored targets. Brightly colored animals like poison arrow frogs, monarch butterflies, and yellow jackets are advertising the fact that they are either bad tasting or dangerous. I think someone should check to see if these birds have poisonous feathers or taste pretty terrible. They are too visible! . Las Vegas Wetlands Project, Nevada. Canon 40d, 500 mm lens. 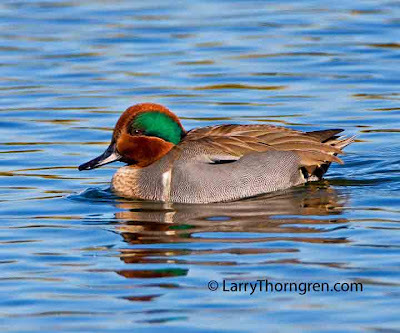 This is the first time that I have ever been close enough to get a good photo of a male Green-Winged Teal. They are usually rather shy and keep their distance. Henderson, Nevada, Bird Viewing Area. Canon 40d, 500 mm lens. 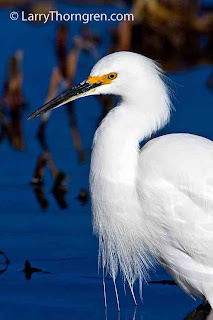 I found this egret so close to the road today that I took this photo from my vehicle window. 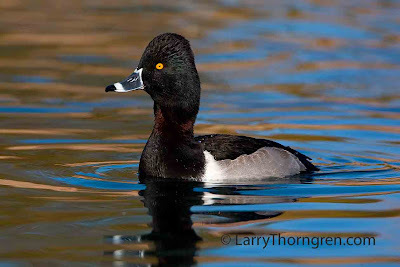 He was competing with some glossy ibises for food in a drainage channel in the Las Vegas, Nevada's wetlands project. This Coot decided that he needed more room to eat the grass he was sharing with this Common Moorhen and attacked the Moorhen. The Moorhen stood it's ground for a few seconds and then gave way to the Coot. 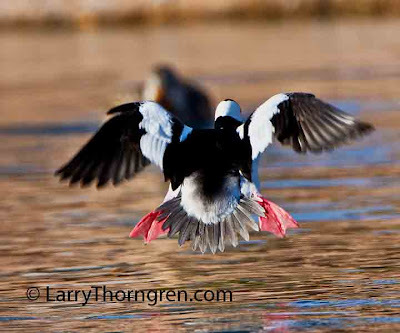 This action all took place at the Henderson, Nevada Bird Viewing Area. 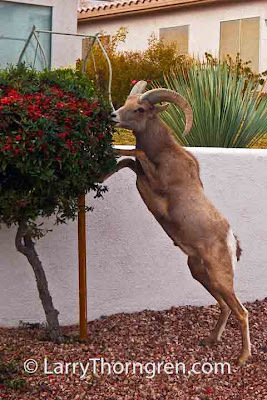 I had time today to look at more of the photos that I took of a desert bighorn eating pyracantha berries and I found this one that I like. He is ignoring the thorny vegetation and just eating the orange berries. As many as 40 of these sheep have been coming to Hemenway Park in Boulder City, Nevada for the past month to feed on the park lawn. I have been told that the number increases to as many as 100 sheep when it gets hot and dry in July and August, which makes the green grass even more attractive. The sheep are completely comfortable around the humans that use the park with them and only show alarm if someone brings their dog too close. I took this photo in November in Yellowstone. These little predators are lightning quick and difficult to focus on for a good photo. 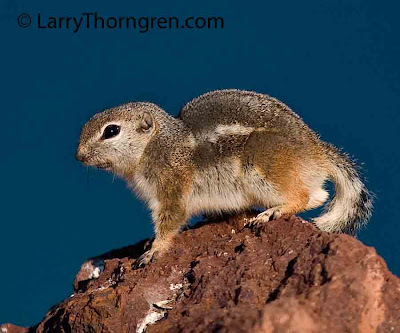 These ground squirrels are active in the Boulder City, Nevada area during the winter. 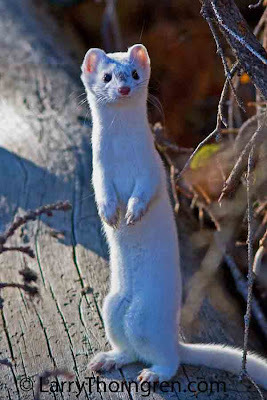 I see them occasionally whenever I hike in the rocky desert areas this time of year. They run with their tails curled over their backs. 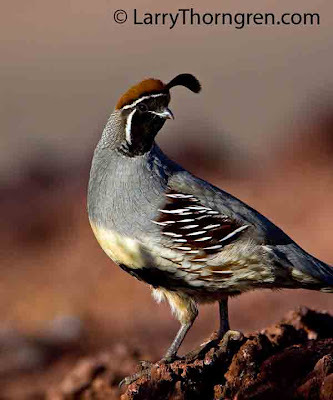 I enjoy seeing these little quail. They seem to be everywhere here near Boulder City, Nevada. 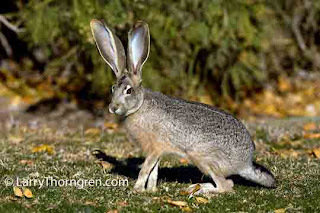 They are found all over town and in the surrounding desert. They move very quickly and it takes patience to get a good photo. I have always enjoyed Mourning Doves. I first heard them calling when I was about 6 on our Idaho farm. I thought it was an owl making the who-hoo-hoo noise and was surprised to see it was a dove. I later found their stick nests with two white eggs and watched the babies grow up and fly. 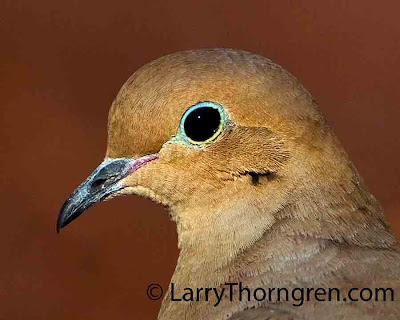 This dove landed close enough to my truck here in Nevada, that I was able to get this photo using a long lens and a window mount. Canon 5D and 500mm lens. 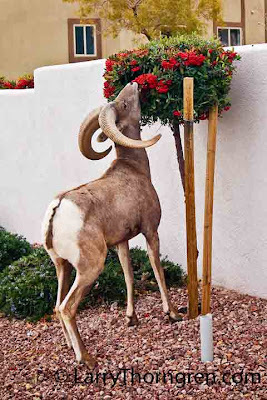 Residents that live near Hemenway Park in Boulder City, Nevada put up with Bighorns nibbling on their landscaping. This Ram was enjoying these Pyracantha berries and allowed me to get close enough for a couple of photos. The Bighorns come off of the nearby mountain and usually spend their time in the park grazing on the lawn. This ram was enjoying a little dessert to go along with his diet of grass. I went out to El Dorado Canyon, South of Las Vegas, Nevada and took the tour of the gold mine there. The tour takes you deep into the tunnels of the old gold mine and lets you see the remains of a quartz vein that yielded millions in gold and silver a century ago. The mine has a violent history with murders, claim jumping and renegade indians all part of the story. 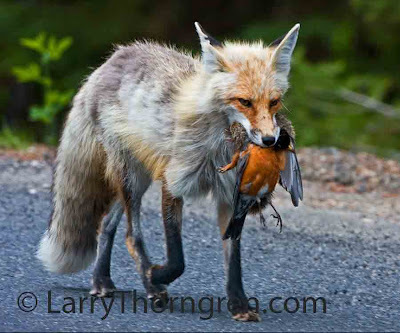 This Red Fox carrying a Robin was going the wrong direction, when I drove by it on the road by my home near Donnelly, Idaho last spring. I turned my truck around, passed the fox, and took it's picture. Only later, when I enlarged it on my computer, did I notice that it had a Columbian Ground Squirrel tucked in it's mouth behind the robin. I will be entering this photo in the International Wildlife Photographer of the Year Contest sponsored by the BBC. I posterized this photo of a Yellowstone Wolf with photoshop elements. I took this photo two years ago in Yellowstone. This wolf is a member of the Mollie's Pack. 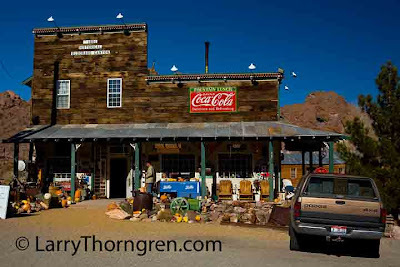 Larry's adventures can somtimes get a little more hairer than his recent travels in Nevada. This very large black bear on Vancouver Island thought that Larry might have a snack or a spare fish on him and approached so close that the camera wouldn't focus. Luckily a well thrown rock did the trick and the bear took off down the stream. Click here to see other black bears. 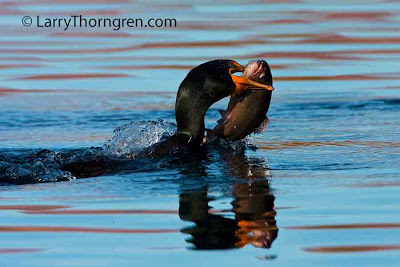 The cormorant is shifting the trout so that it can swallow it. 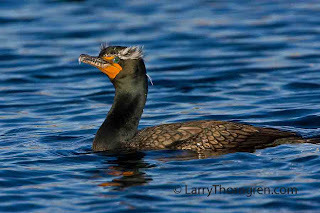 I was surprised to see that cormorants have a beautiful blue throat and roof of mouth that you can see in this photo. 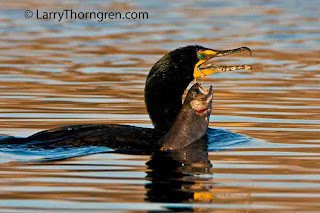 This cormorant is struggling with a large rainbow trout it plans on swallowing. The trout has little chance of getting away once it is caught this securely. 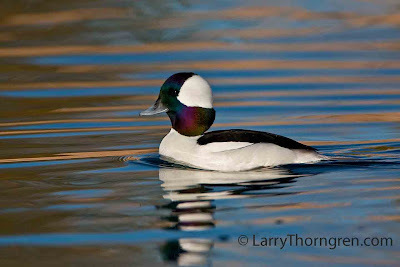 I was getting ready to pack up and leave the pond this morning, when this male Bufflehead came over like he wanted his photo taken. Sometimes the water, the duck and the colors all come together in one photo. These little ducks are usually quite shy and I felt fortunate to be in the right place at the right time. People often ask me how I get some of my photos. The answer is simple : Be There! Spring must be coming. 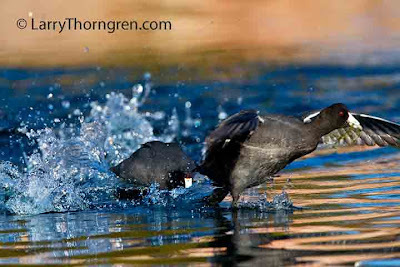 Male coots are constantly chasing each other in the pond I am working. When neither male will give way, they fight as I indicated in a previous post. 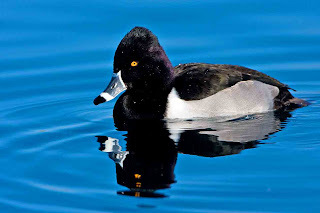 This Ring-Necked Duck stretched his neck this morning and I was finally able to get a photo of him with his red neck ring showing. 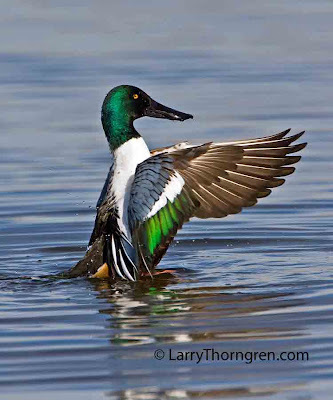 The red colored ring is not visible when the duck is just resting and the ring on his bill is much easier to see. 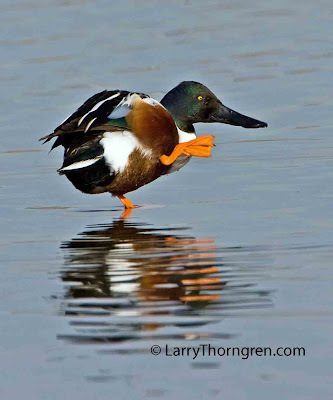 I still think he should be called a ring-billed duck. This Osprey watched as a Cormorant pursued a school of trout in shallow water and then took one of the fish right in front of the Cormorant. The Osprey then turned and brought his catch dirctly at me. The computer in my camera is supposed to keep the bird in focus while the shutter is firing, but never quite lives up to the manufacturer's hype. The bird is not as sharp as I would like. The line is across the photo is an out of focus power line, which I would remove if the photo was better. Back to the fishing pond for another try. 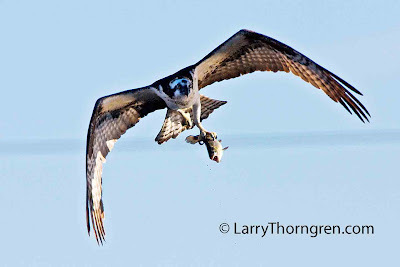 I went to the Veteran's Park Fishing Pond in Boulder City, Nevada, hoping to get a photo of an osprey catching a trout. 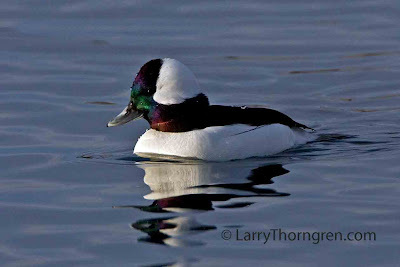 While waiting for the osprey, I saw this little Bufflehead swimming toward me. Usually all you can see of these little guys is black and white. Because of the angle he was swimming and the angle of the morning sun, he was very colorful. The presence of fishermen at the far end of the pond pushed him close enough that I was able to get several nice photos. 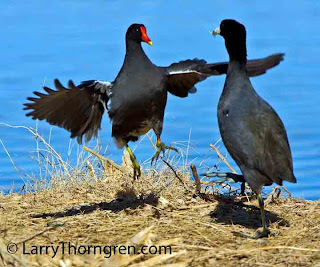 When male coots fight, they grab each other with their clawed feet and drive the claws into the breasts of their opponents. 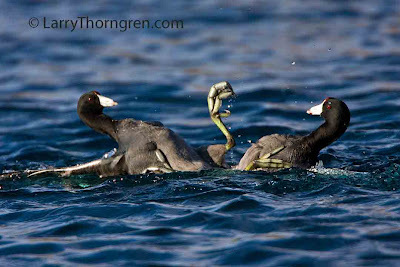 The coot that is about to be grabbed by the clawed foot in the air looks very apprehensive. 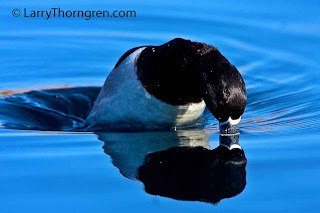 This ring necked duck is starting his dive to get food from the bottom of the pond. The quick action makes him look like he is in a whirl-pool. These small diving ducks are called Ring-Neck Ducks. They get their name from a hard-to-see ring around their necks. They are often called Ringbills because of the obvious ring around their bills. It would make sense to call them by their most easily seen marking- the ring bill. I took photos of these pretty ducks at the Veterans Memorial Park in Boulder City, Nevada. The Cormorant has the trout ready to swallow. 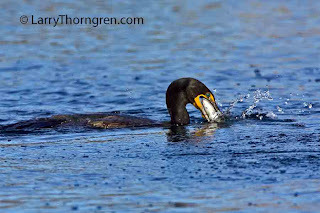 I got some photos of a cormorant catching a trout. This one shows it trying to hold on when it surfaced with the trout in its' bill. 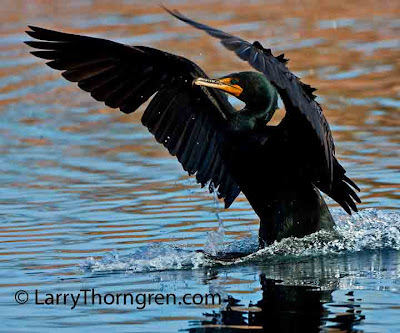 This male cormorant came by about 1/2 hour after the previous photo and I like it better. Tomorrow, maybe he will be swallowing a large trout and be even closer.. 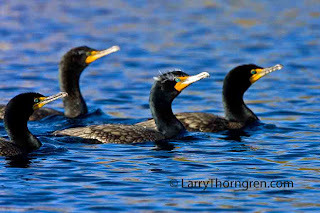 I spent a couple of hours today photographing these cormorants. My goal was to get a shot of one of them swallowing a large trout. None of them caught a trout while I was watching so I took lots of shots of them as they swam by. Large telephoto lenses have limited depth of field, so not all of them are in focus. My general rule when photographing wildlife is to try to get a better photo each time I see a particular species. Next time I see cormorants, I will try to get a different and better photo. 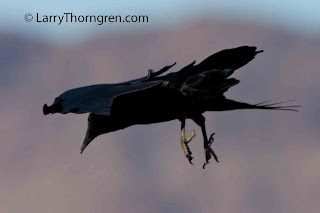 This raven has just launched itself into the air near Hoover Dam in Nevada. 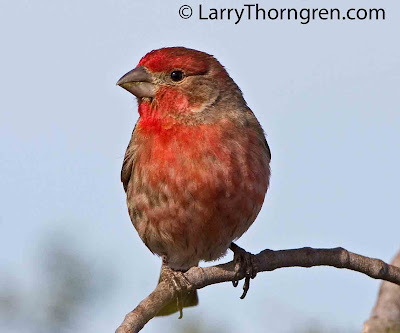 These birds are found from the arctic to the southwest deserts. They are efficient predators and seem to be able to make a living just about anywhere. They are very inteligent and will mimic human words if exposed enough to them. 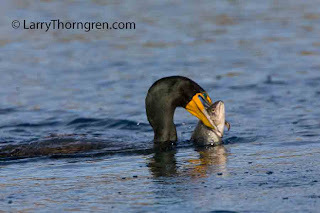 Here is another view of the cormorant with the hooked fish. 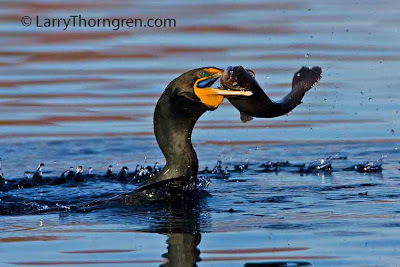 This cormorant has just taken a rainbow trout from a fisherman who was reeling in the trout. The submerged cormant broke the line and the hook is still hanging out of the captured fish's mouth. 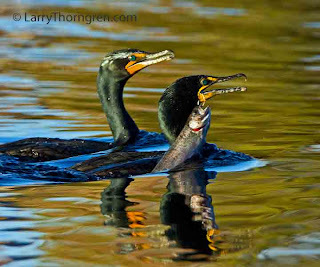 The fish- laden cormorant is being pursued by another cormorant who wants to steal it from the thief. All of this action took place at Veteran's Memorial Park in Boulder City, Nevada this afternoon. One of the more common search terms that web surfers use to find Larry's main photo site is "black wolf with yellow eyes". It appears almost every month. Perhaps that is the easiest way for someone to remember the site. Whatever the reason is, we're glad someone is searching. Here is the photo that appears when using the phrase. 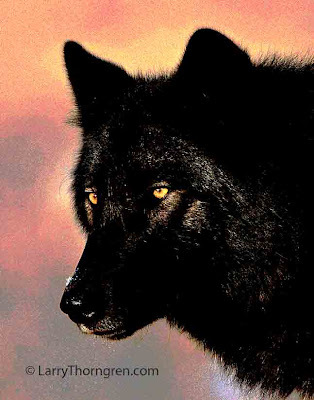 This wolf is/was a member of Yellowstone's Mollie pack. You can click the photo to open up a larger image and to see the skiff of snow on his nose from sniffing out something earlier in the bushes. I took this photo in Boulder City, Nevada. A diet of irrigated green grass makes him look healthy and fat.